Like what you’re reading? Then pull out your camera and join the conversation. Reading is an engaging act and we want you to engage back, move or challenge us by showing us what moves or challenges you. We’re looking for original photographs created by YOU (or you and a friend) in response to whatever it is in Maceo Montoya’s Letters to the Poet from His Brother that makes your eyes well up with tears, your head nod, that makes you hum mmmhmm, or laugh with recognition. Prefer to paint it? Paint! Get inventive, get raw, incorporate the book, and send your creative response (along with your name and contact information) to stephanie@copilotpress.com. Your response will be featured in our online gallery and shared with others by Copilot Press and Letras Latinas, the literary initiative at the Institute for Latino Studies at the University of Notre Dame. Talk back. We want to hear from you. DAVID CAMPOS: "One of the best things about the books I love is that they inspire art. This is what happened when I opened and read Maceo Montoya’s Letters To The Poet From His Brother. The conversation between the art and words inside its pages is spectacular. I read it in one sitting. It moved me. And I was compelled to create beyond just words on a page." 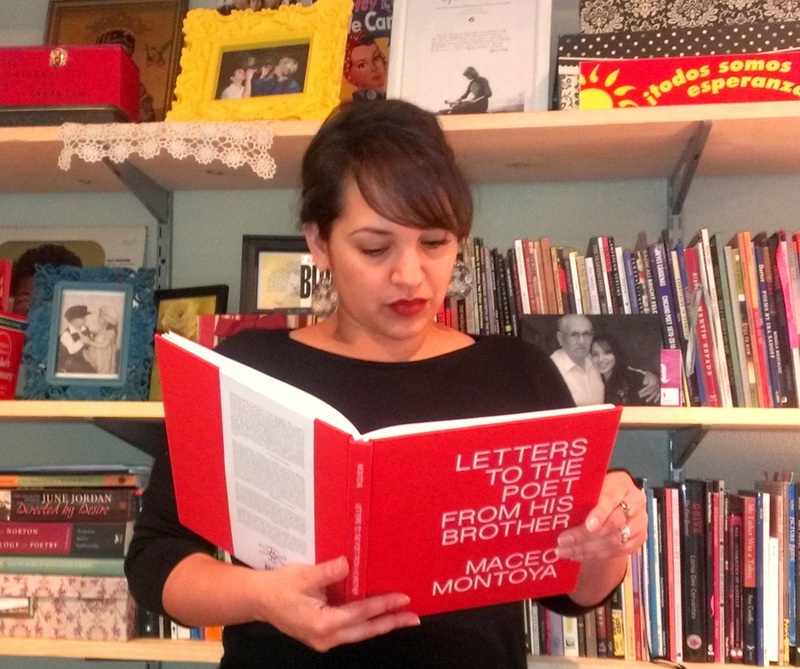 LAURIE ANN GUERRERO, Poet Laureate of San Antonio: "I love this book. Like many I know, I read it in one sitting—staying up ‘til the wee hours because I couldn’t put it down. Maceo Montoya’s honest and deep exploration of his education, his family, his place in history resonated tremendously. He’s aware of how privileged this generation of artists/writers are and how careful & deliberate we must be as we carve out a place for ourselves, always honoring those whose shoulders upon which we stand." FRANCISCO ARAGÓN: Riffing, visually, off David Campos’ comment about art inspiring art, I take a stab at a composition of sorts here—one including Maceo’s “Plate 5: LA INMENSIDAD II,” with its blue-grey sky echoing the swimming pool-blue and blue of pool-side chairs and umbrellas, as seen from the balcony of a seventh floor apartment in Arlington, VA. And the flesh-colored fields and bales of hay? They rhyme nicely with Bill’s arm and toes…But lest I overlook the words, a snippet of my blurb: “…the exquisite prose poem narratives—unapologetic romanticismo in my view—are what completely won me over.” Get this book. Talys Pereira Barbosa 'reads' THE NOUN PAINTER in Paris. Don Won reads MISS ELLA'S TUNNEL MURAL TOURS in Old Town Sacramento.